With Saturday’s Arlington Million looming on the horizon, Night School, the racing industry’s national online fan education program, has a trio of initiatives scheduled to rally the sport’s fan base. First, Tuesday’s 28th of 40 Night School lesson plans for the season will focus on “Turf Handicapping” and feature prominent Chicago-based trainer Chris Block and renowned HRTV analyst and handicapper Jeff Siegel in the live chat. The week’s schedule also includes an online “Arlington Million Handicapping Camp” seminar on Thursday, and will conclude when the Night School Tour visits on-track at Arlington on Saturday for a live, pre-race seminar. Tuesday’s Night School Turf Handicapping session will be co-hosted by Horse Player NOW’s Jeremy Plonk and Joe Kristufek, and also will include video input from analyst Caton Bredar as well as Breeders’ Cup Turf Sprint-winning trainer Bret Calhoun. The 90-minute Night School program gets under way at 8:30 p.m. ET and features live chat, video, fan Q&A with Block and Siegel, as well as downloadable study materials to help fans with handicapping turf races. As usual, this week’s Night School will be followed by another “After Night School Special,” featuring live racing from Mountaineer Park, from 10:00-11:00 p.m. ET. The segment will cover the late daily double in real time with free, live-streaming video and complimentary Daily Racing Form past performances. The Night School “Big Event” seminar schedule continues Thursday with the “Arlington Million Handicapping Camp,” which also gets started at 8:30 p.m. ET. The 60-minute seminar will focus on specific handicapping pointers for Saturday’s Arlington Million and the supporting major stakes races on the Arlington Park undercard. Kristufek, who also serves as the official morning-line oddsmaker at Arlington, will anchor the Camp seminar, and be joined by handicapper Ed DeRosa of BRIS and international racing analyst Pat Cummings of Trakus. Saturday’s Night School Tour visit to Arlington features Kristufek, DeRosa and Marcus Hersh of Daily Racing Form in a pre-race handicapping seminar and fan Q&A at the track’s Starting Gate Theatre. The seminar begins at 11:00 a.m. local, Central time. The Night School Tour traveling troupe also will be on hand at Saratoga Race Course this Saturday and Sunday in conjunction with America’s Best Racing and the New York Racing Association to man the Racing 101 Fan Hub at the Spa. 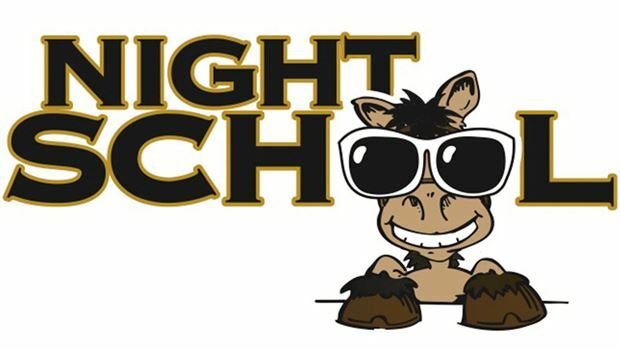 Night School’s Jeremy Plonk will be joined onsite by Horse Player NOW’s Brian Nadeau, Jerry Shottenkirk and Tim Brannan to provide interactive, fan-education lessons throughout the day. Presenting title sponsors for Night School are the National Thoroughbred Racing Association, American Quarter Horse Association, Keeneland, Churchill Downs, Inc. and Daily Racing Form. Tuesday’s session will be the 28th of 40 Night School lesson plans throughout the 2012 season, which continues through November.